Rabdi or Rabri is a popular north Indian sweet made from milk. Basically, Rabdi is thickened sweetened milk having layers of malai or cream in it. 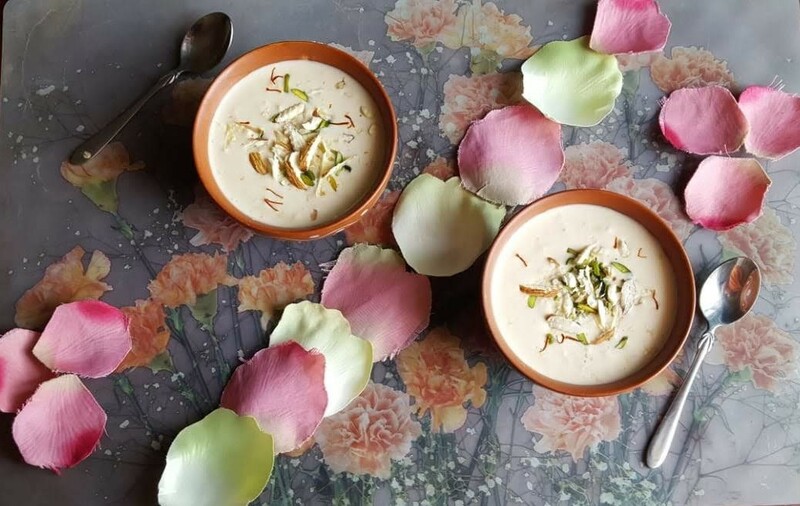 Its made by boiling the whole fat milk or double cream milk on low heat for a long time with it become dense and change the color pinkish.Its flavored with cardamom, saffron with the addition of dry fruits like pistachios and almond. Rabdi is the main ingredients in several desserts such as Channa Kheer, Rasabali etc. First take a heavy base, broad wok or shallow broad pan, broad shape helps in evaporation of the milk faster, if heavy bottom, not the milk gets scorched or burnt or burnt from the base. So take a wok, add milk& once milk starts boiling began to heat milk on a low medium flame till the milk starts in the layer of cream. Once the milk reduces to half, it will take 45-60 minutes then add condensed milk, soaked saffron, cardamom powder stir gently and cook on medium-low flame10-15minutes, stir gently and add half portion off almond and pistachios, rosewater stir gently again. Turn off the heat Sahai Rabdi or Rabri is ready to serve hot or chilled. Rabdi or Rabri can enjoy with the drizzle over a few sweets like Malpua, Sahi Tukda, Falooda etc. Remember one thing milk stir occasionally to make Rabdi that it should not stick to the bottom but do not stir quickly otherwise the cream or layer will not form on top&it will end up with the texture of Basundi. Basundi is a Gujarati sweet dish. For blanched Pistachios, take hot boiling water in a bowl add pistachios, let it sit for 15-20 minutes then discard the water&peelthe skin and slice them.